I love the Fed IV!! Discussion in 'Hats' started by Johnny., Mar 27, 2009. My god... just got my beautiful dark brown Federation IV and fell in love with it. The bashing was by far easier than I first thought, and now I have it shaped practically just like Indy's. The crown's perhaps a TAD higher than I'd like but it's still ok. Apologies - I did get pics, but Photobucket seems to be being a bit awkward Will post up pics ASAP!!! Old Soul 427 likes this. Agreed. I know our newest hats tend to become our favorites, at least for a while, but I think it's going to be tough for another hat to knock my new moonstone Fed IV off the top of the list. First of all, it's comfortable as Hell - yes, that's an oxymoron. I got the deluxe. Comparing this with my Stylemaster, I have to say the sweatband on the Fed IV is a defiite upgrade. The Fed IV has a feel of lightly hugging my head. Don't get me wrong, my Stylemaster is extremely comfortable. The Fed IV is just more comfortable. Second, the moonstone color and the style are versatile. I think I can wear this hat with just about anything. Finally, other people seem to like it. I wore it to work and to an evening event. I got a steady stream of compliments. In fact, I can't remember how many times I said, "Just go to www.hatsdirect.com . . ." People actually wrote down the URL. Congrats, Johnny! I'm enjoying my Tawny Fawn Standard, too--they are great hats. Eventually I've got to get a Moonstone...that will be when I shell out the $$ for a deluxe. Wear it in good health! What can be said that has not already been said about the Federation IV? Nothing that I can think of. But it's kind of like saying "I love you" to your one and only...it only gets better and means more each passing day. Yep, that's how much I love my Fed. Well, "almost"
Gilgamark stated "I know our newest hats tend to become our favorites, at least for a while, but I think it's going to be tough for another hat to knock my new moonstone Fed IV off the top of the list". That is definitely the case for me. I've had a couple of great hats come in since I received my Fed IV, but each time I put that Fed on my head, it just feels great! After the "new car" smell of the hats goes away, I find the Federation retains it's spot as my favorite. Like some others, I learned about the Fed here in the FL. After reading all the rave reviews I had to try one. Wanted a Moonstone but they didn't have one in my size, so I went with Dark Brown. Was aphrehensive but justified that the brown would make a great everyday hat. When the hat arrived, I was nothing but pleased. Though the moonstone seems to be the favorite of members here, I don't think you can go wrong with any color on this hat. As for the crown height, I am curious as to what you and others have for their height. Here is mine. The front is 4.25" high and the rear 3.25" . Mine is 4" in the front; 3 1/2" in back. I put a tugboat effect on it - it goes up to 4 1/2" at the very back of the side dents. The Feds look great guys. I have one in Moonstone and I concur, The Fed IV is my favorite hat too. (for now, anyway...). I have a feeling some participants here are thoroughly sick and tired of seeing Federation posts, and in part I understand why, but I'm also the owner of the standard in Dark Brown and Carbon Grey and I'm telling you, there's a reason there's so much discussion on this hat and it's got nothing to do with Indiana Jones -- it is just a sturdy, versatile, customizable, remarkable hat for the cost and I've just emailed HatsDirect about a Moonstone and Tawny Fawn in my size. If I love the hat, why not run the gauntlet? I own a Moonstone Deluxe. I hate to be the devil's advocate but let me tell you what I don't like about it. The brim is flat and has zero curl. Especially in the back. It's like it was never flanged or something. Maybe it's because of the dimensional brim? I dunno, it's an OK hat (especially for the money) but it doesn't hold a candle to any of my vintage lids. I guess I can't compare it to modern production hats because I don't own any. I will say this, if I knew that I would be spending time in a rain or snow storm, I would grab the Federation first. It is very tough but in my opinion, not very stylish other than the tall crown. I did enjoy personalizing the open crown, though. The brim is flat and has zero curl. Especially in the back. It's like it was never flanged or something. This is what's keeping me from pulling the trigger on one. What I meant by "customizable" above is that you can make it look however you want with some water or steam or just some dexterous hands. You shouldn't have any worries! I look at the Federation as an open canvas. Make it look however you want! It's not difficult at all. I'm going to borrow this thread, as to start another thread for this hat seems ludicrous. So about the brim not snapping too well, could it be cut down at the front and back to make it the same width all the way round? Would this work well or would it no longer look as good? Thank you very much! My first exposure to the Federation was the III, and I couldn't stand it. It didn't just not work on me, it actually made me look really, really terrible because of my own proportions. But just those small modifications to the IV worked wonders for me, and now I've really grown accustomed (finally!) to the straight-sided crown that so many prefer and look for in a hat. I didn't "get it" until I found one that worked on me, and it's the direct reason why I ended up selling my Stylemaster and Fedora -- the taper on both bothered me enough to never really wear them if the Federation IV was sitting there looking back at me. Heh. Silly but true. I'm now in the market for a Federation IV Standard in Tawny Fawn as well as Moonstone. I'm waiting to hear back from HatsDirect. Interesting. All this talk of height measurements got me curious enough to measure my Fed IV at the highest point of the front which is just behind where the crease slopes back. I was going for the high H. Johnson Raiders hat look and wound up with 5 1/4" high. I agree with you, Viper, but I think comparing contemporary hats to vintage hats is comparing apples to oranges. The vintage hats are better. Period. Now, I'm not speaking for high, high-end contemporary hats - over $300. My Fed IV has a slight curl to the back of the brim - not as much as I usually like, but a slight curl. I thought about working some more into it, but decided to let it go for a different look. I don't like the way the felt feels and looks close up but it is definitely a durable hat. I soaked mine many times and it didn't taper but I'm sure eventually it would. I'm new to the fedora scene. 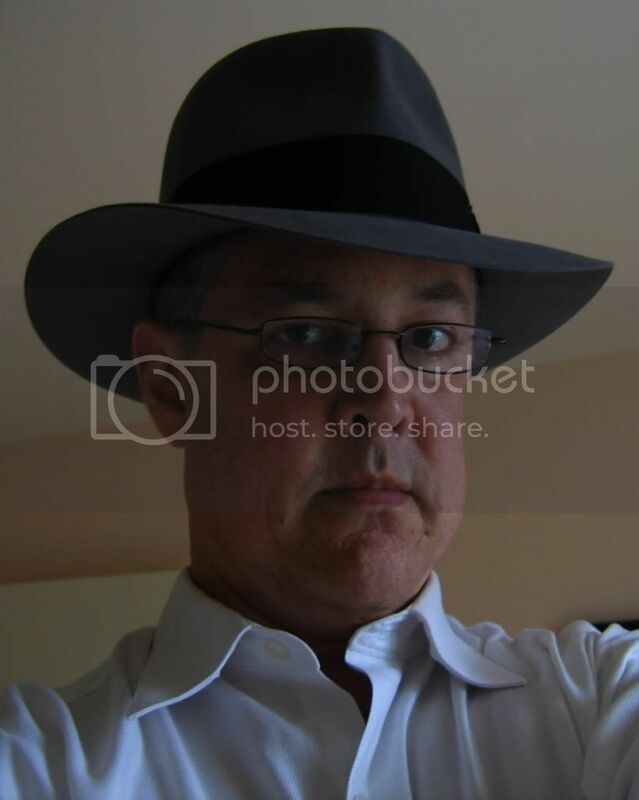 I got a Fed IV regular and did not realize how comfortable it was until I got another fedora (from John Penman). I love my black Penman but my fed IV just feels great on my head. It is a great hat at a great price.